Keep up with the roadies but go where they can't - and have more fun doing it! Cyclocross bikes make great, fast, rugged commuters too! Would love to join and stay in touch with whatever is going on. Have recently bought a specialized single cross. Not much going on here, but I commute on a Specialized Tricross Comp. Have taken it offroad (once so far) to ride the Oaks both ways. Loads of fun (since I've not done any offroad riding before). Great Jack-Of-All-Trades bike. The Biggest Cyclocross Race in the U.S.
Are there any CX races or rides in Sydney? It looks like the best fun, I'd love to give it a go. Also it gives me a new obsession. 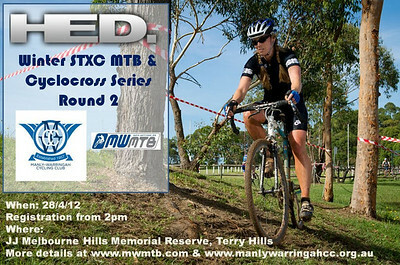 Next July the 3rd race in the national championship is meant to be in NSW, venue to be arranged. Google cyclocross Australia. Cyclo-cross is a discipline generally conducted over a 2.5 to 3.5 circuit, (may be less for these trial events) including clearings, roads, country lanes and paths through forests. The riders have to do several laps of the circuit over a period of no more than an hour. To make their way along steep paths, muddy tracks and artificial obstacles, sometimes the riders even have to carry their bikes. This discipline, which is splendid in itself, is at the same time an unbeatable school of cycling, where you have to combine riding technique, courage and the peak of physical fitness. Technical back up is allowed, which is one of the main differences with mountain bike disciplines. Cyclo cross is generally regarded as a winter sport across Europe with many professional road riders using the discipline as cross training to maintain their fitness in readiness for their summer road racing campaigns. To gauge support for these trial events both current Cycling Australia and 2010 Mountain Bike members will be permitted to compete in these 3 events under the Cycling Australia Insurance cover. For these trials standard racing bikes and mountain bikes to be used, with or without gears. All bikes are to be assessed as being in sound working condition and must have a front and rear working brake attached. These trial events have been approved as Category 4 events (Open Invitation) with entries permitted to be made to the club on the day. If you are U19 category or over and yearning to try something different contact Phil Jones, Illawarra Cyling Club for more information at itv@exemail.com.au. Event rules will be explained to riders on the day. Clarifying- no club or cycling Australia registrations required. Can not do race 1 but am interested in others. You need to be a member of Cyclocross to add comments!